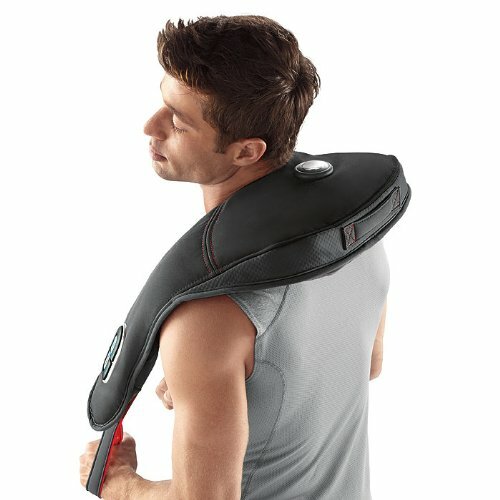 Top 10 Best Neck Massagers Reviews 2019 | Is Shiatsu #1? I know what it’s like sitting at a desk the whole day only to come home to a stiff neck. Sometimes I’m able to persuade my other half to give me a small massage, but he can only give so many massages before his hands get tired. A favorite of mine is a trip to the spa with my friends, but, unfortunately, a day of pampering is expensive and reserved for special occasions. The neck is the area where most people carry all their stress. There are a few nerve endings located in this delicate area, so careful attention should be paid to relieve the stress that accumulates. That’s why having a proper neck massage feels so good — and the reason why they’re so popular. Wouldn’t it be amazing if you could have a really great neck massage more often? Well, perhaps there is a way to bring the spa home to you. I’m talking, of course, about neck massagers. With these incredible machines, you can relax the muscles in your neck and enjoy the tension just lifting away. And, in 2018, they’re actually rather sophisticated bits of technology, producing impressive results. If you want to relieve your neck pain, you’re in luck! Today, Blissful Relaxation takes a look at the best neck massager on the market — the ones that actually get results. Let’s dive straight in, shall we? I know how a hard day at work can leave your body stressed – sometimes we don’t even know until it accumulates. If your neck is feeling tight, this neck massager is great for soothing sore muscles while invigorating your circulatory system to deliver consistent relief. 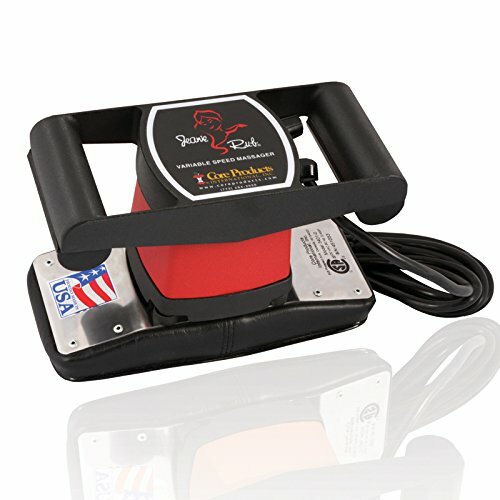 The Jeanie Rub is one of the most powerful on the market, too, functioning at comfortably over 3,000RPM when on maximum settings. This allows you to get at deep-seated muscular pain, which can have a hugely positive impact on your general wellbeing. This massager will also become a favorite for athletes and fitness enthusiasts. If you’re looking for action, deep penetration, and relaxation, this is the massager you need! With varying speeds, you can control the action and speed to suit your needs — from max settings to relieve chronic, long-term pain, to the lower settings to give your muscles a quick release. Best of all, the product is incredibly well built, so it should last for years — making it great value for money. It does need to be applied to your muscles manually — you can use it anywhere on the body, not just your neck — and so the quality craftsmanship will be well appreciated. The machine is rather heavy at around 7lbs, so it’s not ideal for carrying around, but in use, this extra weight really helps you apply pressure where it’s needed! A neck massage machine one that everyone here at Blissful Relaxation strongly recommends! Ah Brookstone, how do they keep doing it? 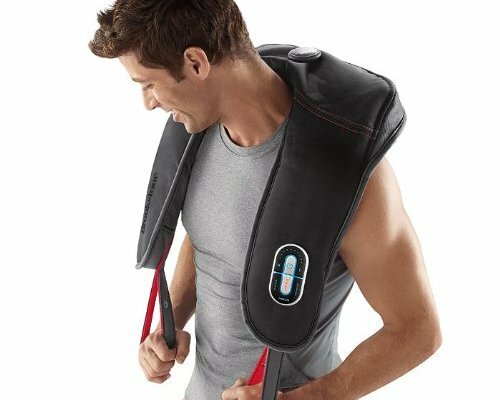 Always featuring strongly in our best of lists, this time we see Brookstone’s Neck & Shoulder Sport Massager performing well in the neck massager category. What makes this Brookstone so good? Well for a start, it looks stylish and it’s really easy to use — simply place it over your shoulders and let it do its thing! It’s really well built, too, so you’ll get a lot of use out of it. It might cost a little more than some of the competition, but because of its durability, you’ll be able to use this neck massager for years! As always, Brookstone models come packed with features, and this one is no different. There’s 10 power levels to pick from, ranging from a light massage to deep tissue sports massage — hence the Brookstone’s popularity with athletes. As the product name alludes to, the Brookstone also includes a heating element. This is particularly effective at loosening the muscles, and it makes the massaging features far more effective. Best of all, however, this neck massager comes with three ‘programs’, allowing you to instantly switch to a setting to meet your needs. A really, really great product, and one that I couldn’t live without! There is a lot of punch and power in this Thumper! If you’ve been to the chiropractor before, you’ve probably seen the bigger version of this! Now you can have the same relief at home with this fantastic personal massager. I remember being so sore from exercising that I couldn’t reach my back to give myself the massage that I needed. This mini massager solves all that – you can finally reach those hard to access areas like your neck, shoulders, and mid-back. With the lighter, smaller, well-designed Thumper Mini Pro 2 Massager, you get to rub out aches and soreness — it’s nearly as effective as a professional deep tissue massage. 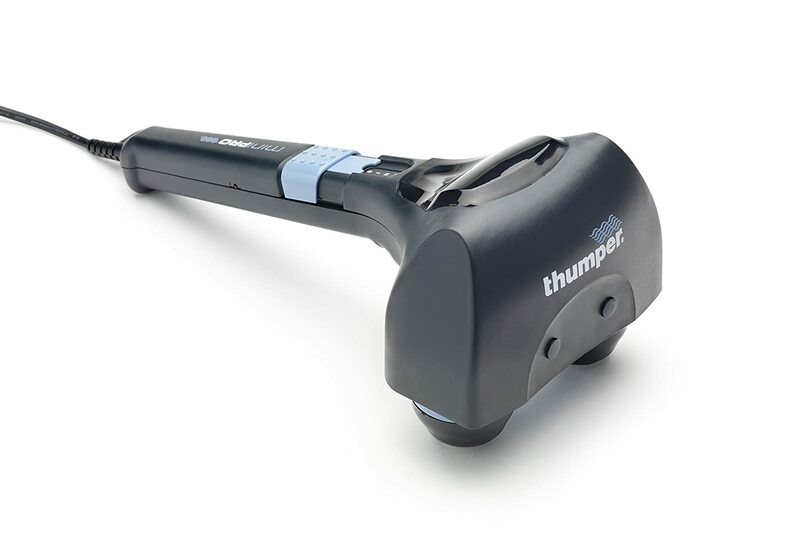 The massaging, pulsating motion lets the Thumper relieve even the deepest muscle pains. It comes with a number of settings, giving you a choice of power and controlling the strength you want. It’s also more than powerful enough to massage through clothes — which means it can be used practically anywhere. It’s also small enough to easily pack away, for vacation massages! It’s worth pointing out that the Thumper is a powerful piece of kit. When switched onto the most powerful settings, you might actually find it too powerful for the delicate neck muscles, so use with caution! That being said, if you switch the settings into the mid-range, you can give your neck a really thorough massage! This one is also a heating, massaging product designed to take away aching muscles. But with a twist. The straps of this massager are designed so that you can wear it while it does its job. All you need to do is simply drape it around your neck like a towel. It is also very light. Both these features are excellent because you can continue doing whatever it is you are doing, while it does its job. This passive capability is what makes it a very popular massager. 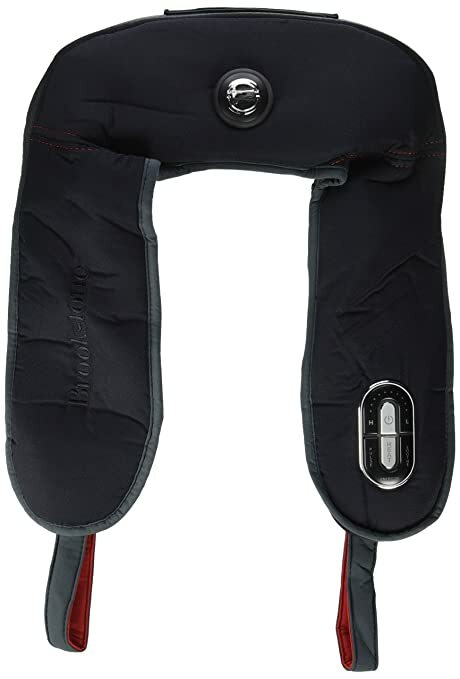 The straps can be adjusted so that it presses the exact area you want to be massaged. This device comes with eight kneading modes. So far the conversation has been about relatively simple, DIY massaging products. Now it is time to kick things up a notch. And an excellent example of that would be the MR-2-2-Speed electric professional back massager. The name says it all. This is a massager which was designed with the professional in mind. However, this does not mean that only the pros can use it. It is designed for easy operation, which means the entire household can give each other massages. The electric motor has two speeds; high and low. It has two handles on one side and the business end on the other. You grip the handles like you would a steering wheel and then press it on the person getting the massage. Because of its relatively low price point, it is an entry level product in its category. The idea is to give the average user a taste of a high-end product. Zyllion is a manufacturer known to make great health related products. And the ZMA-08 is no exception. 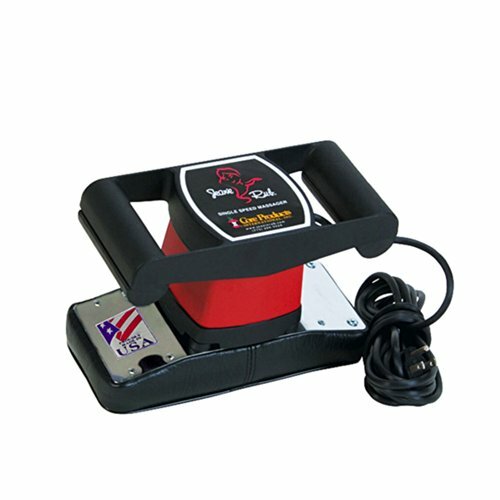 What makes this one unique is that you do not have to hold it while it does its job, and it is heated! Resembling a thick blanket, you simply drape it on the problem area and let it do its magic. Once you turn it on the motors get to work and start massaging the skin. The intensity of the massage can be adjusted. Why is heat a good thing in a massage? Simple, it helps with blood circulation, which in turn help heal damaged tissue. There is total of 20 different massage modes and 10 different intensity levels, all to give you a well-rounded massage experience. Another great product from Zillion, the ZMA- 13 BK is based on the pillow design. If you travel a lot then this one would be the perfect little companion to take with you. As the name indicates, it is essentially a pillow that has massage function built in. This one is also popular for those who sit behind a desk for long periods of time. In fact, because of its compact size, you can even take it to work! At little over 2 inches thickness, and with adjustable straps, you will be able to strap it to your work chair with no problem. With four shiatsu massagers built in, it will knead away all those aches. The heating function will help with blood circulation. Ultimately, this massager is all about portability. You can take it practically anywhere you go and use it. Another pillow design based massaging product, the HoMedics SP-100H 3D boasts of new technology. The massaging function is designed to mimic the pressing motion, which involves inward and outward movement of the massaging nodes. Therefore it is designated as 3D massaging technology. However, it is also capable of going into vibration mode. Combine this with the heating feature, you now have a truly multi-function massaging product. What’s more, with its light and compact design, taking it wherever you go will not be a problem. Since it is a pillow based design, it will work great as a neck, shoulder and back massager. Not everyone wants a fancy massaging product. You may just want something small, simple and light to get the job done. If that’s the case, then the kneading massage cushion by Prospera is just the one for you. Comparatively low on features compared to its competitors, it still gets the job done. This is accomplished by two small kneading heads. The cushion comes with straps so that you can attach it to whatever chair you’re sitting on. Hence making it a popular choice for drivers. In fact, it even comes with an electric cable that can use the car cigarette lighter as a power source. Another innovative product from the HoMedics people, the NMS-360 is an interesting contraption. It is designed to wrap around the neck, hence its -360 designation. Predictably, this massager was designed to relieve neck pain. When you are ready to use it, just wrap it around the neck and take advantage of its three different massaging options. These include vibration, shiatsu, and a combined vibration-shiatsu massage. It comes with heating adjustments also. Integrated controls along with the flex handles make choosing different functions easy and intuitive. The shiatsu function is considered to be one of the most realistic for an electric massager. Since it is designed to use in one area, the neck, in this case, it is one of the lightest and most compact massagers available. How to Prevent Winter Depression? It is important to also note that blissfulrelaxation.com is a participant in the Amazon Services LLC Associates Program, an affiliate advertising program designed to provide a means for sites to earn advertising fees by advertising and linking to Amazon.com and its partnered brands/websites.